Lars Frandsen was a student of the late Leif Christensen, a preeminent pioneer in the rediscovery of the 19th-century guitar literature and a strong advocate of its historical performance practice. A graduate of the Royal Academy of Music in London, Yale University, and the Eastman School of Music, Frandsen holds a doctoral degree in performance and literature. He was the assistant to the renowned lute player Paul O'Dette while at Eastman, where he also studied in master classes and doctoral seminars with equally well-renowned forte-pianist Malcolm Bilson. In addition, he has performed several times in master classes conducted by John Williams, David Russell, and Manuel Barruecco. 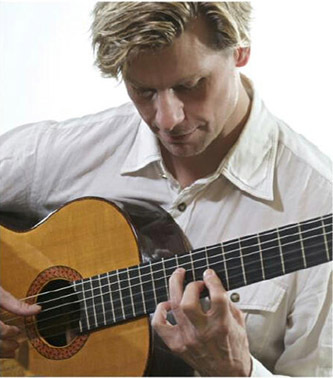 Frandsen was the first guitarist to play and coach chamber music (during five consecutive concert seasons) at the Apple Hill Summer School, where he taught and performed with members of the New York Philharmonic and London, Chicago, and Boston Symphony Orchestras. Lars has performed in a variety of venues such as Avery Fisher Hall at Lincoln Center, Walt Whitman Theatre in Brooklyn, and Dukes Hall in London, and he has recorded world music for CBS records in India. Frandsen directs the classical guitar program at the Conservatory of Music of Brooklyn College, where he has taught for nearly 20 years. He also directs the theory and ear training program at the Manhattan Campus of Nyack College. He is an associate professor at both colleges. Frandsen founded the Brooklyn Guitar Quartet with Jesse Miller.